When rescuers from Hope For Paws responded to reports of a homeless dog hiding in a Los Angeles waste management plant, they weren't sure what they would find, but they knew that a frightened stray wouldn't last long at the dump. This dog needed rescuing right away. 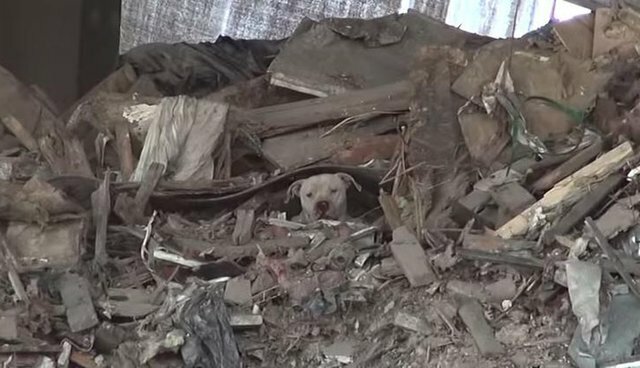 The rescuers' camera zoomed in on the scared face of a white pit bull, barely visible in a big heap of trash. 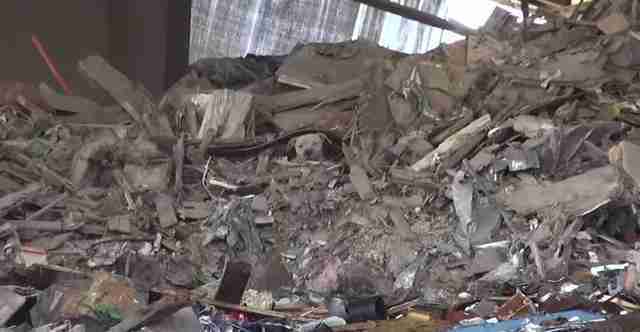 Every time rescuers tried to get close, the scared pitty retreated farther into the piles of garbage. Disheartened after hours of trying to coax the dog out, the rescuers went home and came back again the next day. This time, they were determined not to come home without the pup. 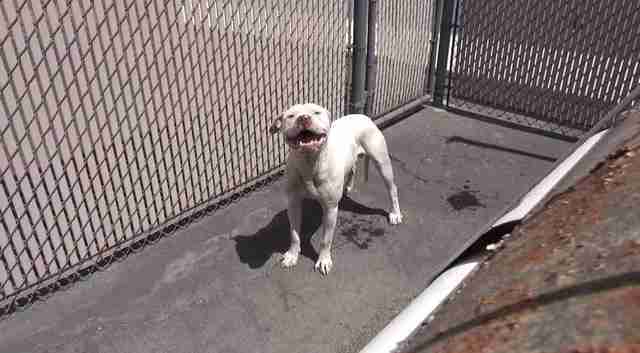 The rescuers followed him into a fenced-in corner - but the terrified stray wouldn't let them near him. But after 30 minutes of sitting calmly, and speaking in a soft, soothing voice, the rescuers had finally gained the pup's trust enough to slip a leash over his head. 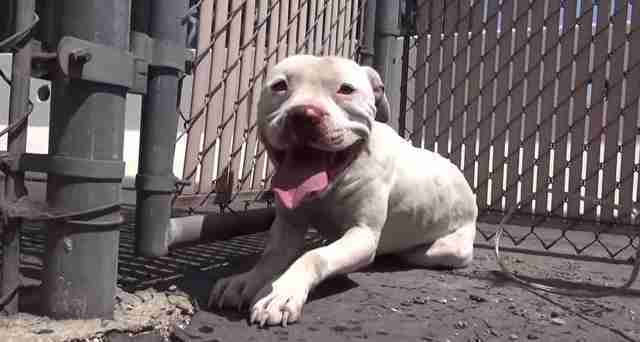 Once the leash was on, it was like a switch had been flipped, turning the frightened stray into a hopeful rescue dog. He even gratefully accepted cuddles from his patient rescuers. They decided to call him Thor. 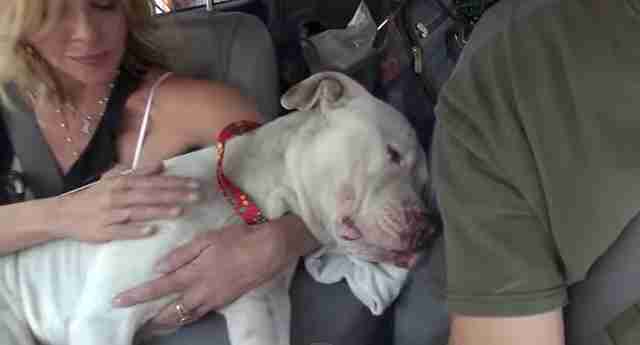 Thor took his first car ride like a pro, relaxing in his rescuers arms. It's hard to believe that he's the same frightened face that was peering out from inside a pile of trash only hours earlier. 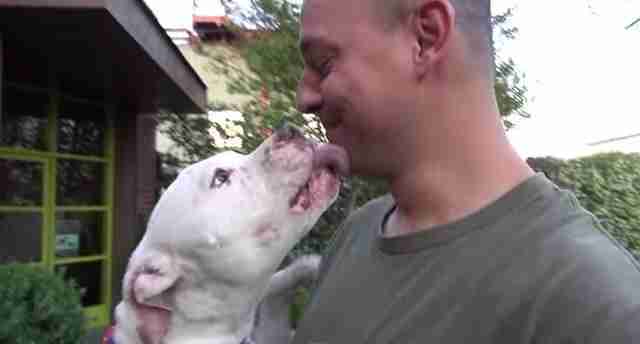 After getting a much needed bath and some medical attention, Thor took it upon himself to give his rescuer a sloppy thank you kiss. It's clear this pup has a heart full of love, and just needed a chance to show it. Thor is currently up for adoption through LA Animal Rescue - and the two devoted humans who made his rescue possible went to visit him at an adoption event earlier this week. If any dog deserves a happy ending, it's this guy.